Just wanted to stop in and introduce myself and show off my new ride. The only thing I've done so far is paint the letters on my tires. I will be adding more soon and also adding pics as I go along. Let me know what you think about the tires and I am up for suggestions on what to add next. Yeah, I've been riding for about 1 year. I started on my Honda Rebel 250 and completed the MSF course. I deided that it was time to move up to a bigger bike and I fell in love with the White 07 CBR. I have only had it for a couple of weeks, but so far, I really like the bike. My only complaint, well, I have two actually. 1) There is no dip stick to check the oil and 2) There is no helmet lock - at least not one I can find. Other than that, it is one sweet ride! I painted the tires myself and was really pleased with how they turned out. It was simple, fairly quick, and very inexpensive. I have some frame sliders that I will probably add next. After that, I would like the flush mount turn signals, HID headlights, and of course, an exhaust. Oh yeah, and I will probably stripe the wheels too. Just wanted to say welcome to the forum! And man, that is one sweet bike! I love the white color scheme! Anyway, seems like you have some good plans in the making for your bike. If I can help at all let me know....I try to do as much as I can to my own bike with the help of everyone here on the forum. They're knowledge has helped me a lot. The bike is looking really nice though. Keep it up....can't wait to see more pics of your upgrades!!! Awesome to hear that you're excited about mods you'll definitely find a bunch of help here for that sort of thing, and great how to's looking forward to some pics of the mods as you do them. ohhh, thats a nice bike!! if i had the money i woulda have went with that exact one, i love the white, it is beautiful! There is a helmet thingy to use as a helmet lock in my toolkit that comes with the bike. I've never used it though. If there is anything I'd recommend, it's getting crash protectors on straight away. You never know when s#it happens. Welcome and nice ride. 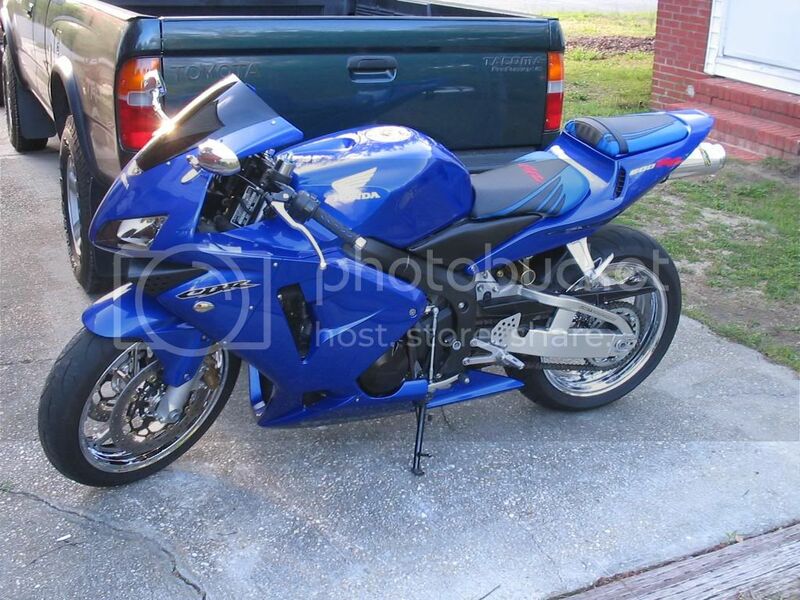 My CBR is my track bike but it still looks like a new bike and only has 3300 miles. We are the original owners too. Enjoy and be safe. A lot of bikes don't have a dipstick, that's what the site glass is for... Also, when you take off your passenger seat, you can use either of the rings that the seat hooks into. I don't think they are specifically made for that, but they work and I use them all the time.